Insomnia is a common sleep condition that can be acute (short-term) or chronic (ongoing). Acute insomnia is often is brought on by situations such as stress at work, family pressures or a traumatic event. Chronic insomnia is known to last much longer and can affect people for years. Most cases of chronic insomnia are due to other underlying health conditions. Insomnia can cause a lack of energy throughout the day. It can also make you feel anxious, depressed or irritable. You may have trouble focusing on tasks, paying attention, learning and remembering. These problems can prevent you from doing your best at work or school. Magnesium was first recognised as an element in 1755, over 100 years after its compound Epsom salt (Magnesium Sulphate) was discovered in England and had already gained popularity for its wide range of health benefits. Since its discovery, Magnesium has proven to be one of the most beneficial minerals with modern science showing it to be essential for over 300 enzymatic reactions within the human body. 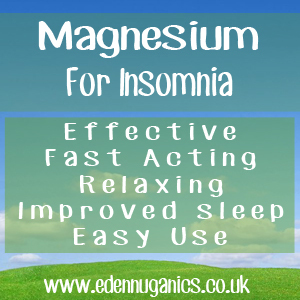 Out of all the essential minerals we require, Magnesium is by far the most important when it comes to a good night's sleep. Magnesium acts directly on cell walls throughout the body by closing calcium channels. This reduces electrical conduction in nerves and muscles. It is this key ability, of calming neuronal activity, that's responsible for its muscle-relaxant and sedative properties. Magnesium Bath - Magnesium Chloride can be dissolved in water at body temperature and is easily absorbed through the skin (transdermal). This makes it ideal for adding to bath water for a whole body soak that will leave your muscles feeling loose and relaxed and have a strong sedative effect, aiding sleep and relaxation. Simply add around 1 cup or 250g of magnesium chloride flakes to your bath and wait for around 5 minutes for it to dissolve before getting in. A 10 minutes soak is all that's needed for your body to top up its magnesium levels. Supplementation - Although baths are great, they not always practical and for those of us with busy lifestyles, supplementation and be an easier and equally effective option when battling sleeplessness. The most popular form of Magnesium supplement is Magnesium Citrate. Aside from that found in foods, this easily absorbable form of the mineral is widely viewed as the best. How can Magnesium Help? - Reduce insomnia, stress, migraine & stroke! Melatonin - Melatonin is a natural hormone made by your body's pineal gland. This is a bean-sized gland located in the middle of the brain. During the day the pineal is inactive. However, When the sun goes down and night begins, the pineal is 'brought to life' and begins to actively produce melatonin, which is released into the blood. Usually, this occurs after 10pm. As a result, melatonin levels in the blood rise sharply and you begin to feel less alert and more sleepy. Melatonin levels in the blood stay elevated for about 10 - 12 hours. Valerian - Valerian is one of the most powerful herbs for improving sleep that we know of. In a double-blind study, 44 percent of insomniacs who took Valerian described the quality of their sleep as "perfect," and 99 percent said their sleep had improved significantly. None of the patients reported any side effects. "Valerian powder is the best nervine known. I have made great use of it and have always found it to produce the most beneficial effects in all cases of nervous affection. In fact, it would be difficult to get along in my practice in many cases without this important article." Samuel Thomson - 1831. In adults, the daily recommended magnesium intake is 300 - 400mg. This can be obtained from supplements or foods rich in the mineral. Raw, cocoa powder - However, this can act as a stimulant.